This Sunday night we honor the great films of 2011 with The 84th Annual Academy Awards. Following that prestigious event, audiences and Hollywood will turn their attention to 2012. What movies will slay box offices? What talents will break through into the spotlight? And what films will capture the attention of the next award season? While I don’t have a crystal ball, I have managed to pinpoint 12 films to put on your movie-going radar this year. It’s the final installment in Christopher Nolan’s critically acclaimed Batman trilogy, and even though the film doesn’t hit theaters until July, some midnight showings are already sold out. According to MetaCritic, the rumored $250 million production features even more scenes filmed in the IMAX format than 2008's The Dark Knight, and Joseph Gordon-Levitt, Tom Hardy, and Anne Hathaway join the already stellar returning cast. Needless to say, this film is way worthy of all the buzz and buildup. This pick doesn’t need much explanation. The amazing book trilogy will now be a four-part film franchise. It will most likely satiate the movie-going needs of both Twi-Hards and Potterites alike, plus all the rest of us who love either the book series, Jennifer Lawrence, dystopian tales, or all of the above. The buzz on this film is boiling over, so thank goodness it comes out in a month. Watch the trailer here. Cue the collective groans. I know you’re thinking “Another Spider-Man? C’mon!” But if Christopher Nolan proved anything with his Batman franchise, it’s that reboots can not only be vastly better than the originals, but bring in a lot more bucks, too. Directed by Marc Webb (500 Days of Summer) and starring The Social Network’s Andrew Garfield and Hollywood sweetheart Emma Stone, the film is based more on the comic book series.Couple these factors with audiences’ overwhelming adoration for all things Spidey, and methinks this will be quite the blockbuster. Plus the trailer looks awesome. Director Ruben Fleischer has changed his pace, switching from modestly budgeted action-comedy like Zombieland and 30 Minutes or Less to a true crime drama set in late 1940s Los Angeles. Not intrigued yet? Well, I have two words for you: Ryan Gosling. Yes, the man of 2011 is staking his claim on 2012, too. Supporting the Gos is Sean Penn, who plays infamous gangster Mickey Cohen, a mogul who started as muscle for Al Capone in Chicago. Gosling and Josh Brolin play the two coppers determined to bring him down. And Emma Stone is the femme fatale coming between them. Another superhero flick has made my 2012 list. But how could this one not? Joss Whedon of Buffy the Vampire Slayer and Firefly fame co-writes and directs. In the film, Iron Man, Captain America, and Thor (each of whom had their own movies) team up with Nick Fury, Hawkeye, the Incredible Hulk, and Black Widow to stop Thor’s brother Loki from destroying the world. All these superheroes are sure to deliver a lot of great action. Fingers crossed this doesn’t turn into the New Year’s Eve of superhero movies, though. Originally this film wasn’t on my radar in the slightest, but then The Early Word reported that Cosmopolis beat out Breaking Dawn, Pt. 2 and The Hunger Games in MTV’s Movie Brawl for Must-See Movie of 2012. So how did it win millions of votes? While Eastern Promises was incredible, it most likely wasn’t director David Cronenberg that swayed voters. And even though he is loveable, it probably wasn’t Paul Giammati either. More likely, voters literally went weak in the knees for R. Pat. Yes, Cosmopolis, based off Don DeLillo’s 2003 novel, stars Robert Pattinson. Fans seemed to have banded together to show their support for the heartthrob’s post-vampire career. In addition to MTV, this film also made Paste Magazine and The Playlist’s film previews. Why? All the non-Pattinson reasons listed above. Fans of The Lord of the Rings franchise have long been clamoring for a big-screen, big-budget adaptation of The Hobbit. According to Yahoo! Movies, “a change of directors, lawsuits, and the aforementioned bankruptcy of MGM delayed things for a while,” but Peter Jackson is intending to deliver around Christmastime of 2012. If the Oscar-winning first three films and the teaser trailer are any indication, The Hobbit: An Unexpected Journey should be dazzling. Pixar is finally making way for a female protagonist. They’re also venturing away from the world of sequels. Set in the Scottish highlands, Brave focuses on a 10th century Scottish princess named Merida. Pixar delivers when it comes to movies, so it’s no surprise that Brave made just about every 2012 film preview. After some MGM drama and many rumors, the next Daniel Craig Bond film is happening. With Javier Bardem starring as the villain and Sam Mendes directing, there’s much excitement swirling around the 23rd Bond film. Featuring a completely original storyline—that’s right, no Ian Fleming novel here—the film follows Agent 007 as he hunts down the people who attacked MI6, while struggling with his relationship with boss M.
Originally a prequel to Alien, but now simply set in that universe, Ridley Scott has returned to his sci-fi roots for Prometheus. While details of the film are fairly under wraps, we do know it stars the man who can do no wrong, Michael Fassbender, and the original girl with dragon tat, Noomi Rapace. According to The Playlist, “it’s about a team of explorers who discover a clue to the origins of mankind on Earth, leading them on a journey to the darkest corners of the universe.” Need your interest furthered piqued? Check out the teaser trailer below. Whether you’re a diehard fan or just happy to see this series end, it’s hard to deny Breaking Dawn, Pt. 2 as an anticipated film of 2012. But that’s what many did. Out all the lists I reviewed, only Yahoo! Movies listed Breaking Dawn, Pt. 2 on their film preview. Perhaps four movies were too many for most. Slated for a November 2012 release, the film will follow newly made vampire Bella and her hubby Edward as they team up with other vampire clans as well as Jacob and his werewolves to protect their hybrid baby from the Volturi. Now those of us who have read the books know this whole plot isn’t as climactic as it sounds, but if the rest of the films are any indication, director Bill Condon and his team are sure going to try to make this final the most epic ever. What movies are you most anticipating in 2012? Did I miss any? Share your thoughts in the comments section below or on Twitter: @midwesttape #filmpreview. Audiobook lovers rejoice! The year 2012 looks to be filled with a wealth of literary treasures. Now that Groundhog Day is in the rearview mirror, let’s take a look at what lies ahead—aside from six more weeks of winter. Just released on February 7 was Stay Awake, a new collection of short stories from Dan Chaon. Chaon’s last collection was a finalist for the National Book Award in 2001. Here he returns to the short form for the first time in eleven years after publishing two novels in the meantime. On Valentine’s Day, readers will fall in love with a trio of books. Sophie Kinsella looks to continue her bestselling ways with I’ve Got Your Number, while Tatiana de Rosnay, author of Sarah’s Key and A Secret Kept, returns with The House I Loved. If you like a little horror with your romance, Anne Rice has the answer with The Wolf Gift. Finishing out February, there’s Other People We Married on February 21 from Emma Straub, daughter of novelist Peter Straub and a powerful author in her own right. On the 28th, bestseller Jodi Picoult offers Lone Wolf, while Ramona Ausubel makes a conspicuous debut with No One Is Here Except All of Us, a fable of a Jewish village in Romania trying to persevere through the horrors of World War II. Marilynne Robinson’s novel Gilead won the 2005 Pulitzer Prize for fiction. On March 13 she turns her talents to non-fiction with When I Was a Child I Read Books, a collection of essays on a variety of themes. Going in the other direction, Sanjay Gupta, chief medical correspondent for CNN, tries his hand at fiction in Monday Mornings, about a group of surgeons who confront their failures in weekly “Morbidity and Mortality” meetings. Also in March, Lyndsay Faye follows up her Sherlock Holmes/Jack the Ripper pastiche with another work of historical crime fiction, The Gods of Gotham. Then, acclaimed writer Lionel Shriver (another National Book Award finalist) presents The New Republic, a novel about terrorism that she originally wrote in 1998 but shelved after the September 11 World Trade Center attacks. April is the month for heavy hitters on the bestseller lists. First up, on the 3rd, is Mary Higgins Clark with The Lost Years. On the 10th, John Grisham eschews the courtroom for the baseball diamond in Calico Joe. Stephen King follows up 11/22/63 with the eighth installment in his Dark Tower series, The Wind Through the Keyhole, on the 24th. Also on that day, critical lightning rod Jonathan Franzen returns with his latest book of essays, Farther Away. Further out on the horizon, there’s still plenty to look forward to: Deadlocked, a new Southern Vampire book from Charlaine Harris; Home, by Toni Morrison, a novel about racial inequality and the aftereffects of war; Bring Up the Bodies, the sequel to Wolf Hall by Hilary Mantel; In One Person by venerable author John Irving; and Mortality, the final memoir by firebrand and critic Christopher Hitchens, who passed away in December. Of course, this is just a small sampling of what awaits us in the world of audiobooks in 2012. What new and upcoming releases are you and your patrons most looking forward to? Let us know in the comments section below. The 2012 ALA Midwinter Conference took place at the Dallas Convention Center 19–23 January in Dallas, Texas. Being that Texas sure beats Ohio in January, Midwest Tape was once again proud to exhibit at the show. This show not only gave us an additional chance to meet with customers, but it was also the last time we used our current booth. That’s right. Our booth has run its course, which means there will be something very spectacular to behold at PLA. Will you be there? 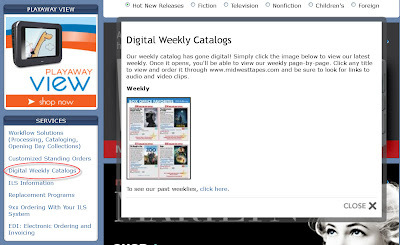 During ALA Midwinter, attendees could enter to win a $2500 shopping spree at MidwestTapes.com. We received 91 entries for the grand prize, and after the shop wrapped up, we drew a winner. A big congratulations to Alice Neve, Public Services Manager for the Rondo Community Outreach Center Library in St. Paul, Minnesota. Be sure to drop her a congratulatory line in our comments section! Did you attend ALA Midwinter? What did you enjoy most at the show?